We know that Bodum can do that extremely well. After all, it's what Bodum does best. That’s why you should reach for Bodum again when it comes to the safe storage of your coffee beans. Without these beans, would your morning sanity even exist? With a body made from borosilicate glass, this Chambord Storage Jar is tough yet lightweight. And no matter how many times you refill it with freshly roasted coffee beans, the glass won’t cloud. 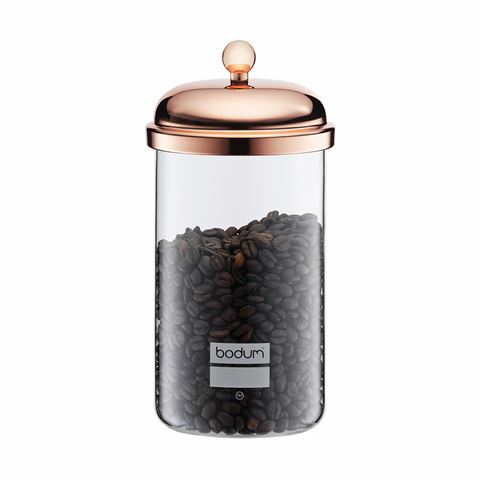 The copper plated handle earns this very attractive storage canister extra style points, so you better hide it from your guests the next time they pop over for coffee. Lid is made from copper plated steel. Jug is made from lightweight borosilicate glass.